FIGURE 1. Long-legged flies species (Dolichopus spp.) 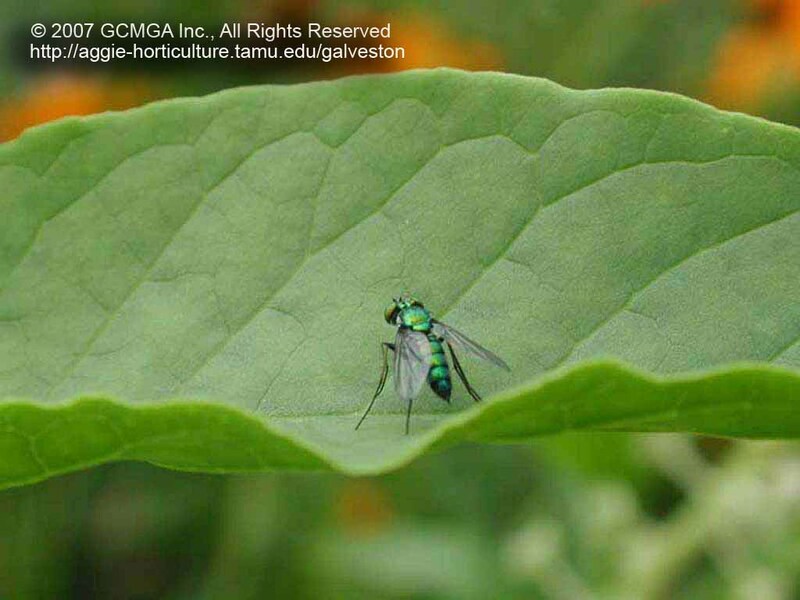 in the Galveston-Houston region are slender and often beautifully colored with green, blue, metallic gold or silver. Some look almost like flying jewelry! FIGURE 2. A head-on view of a long-legged fly. They are very common (albeit not well-recognized nor well-known) and can be an important arsenal in the home gardener�s battle with insect pests. FIGURE 3. Two insect predators size each other up on a plant ID marker in our demonstration at the Galveston County Extension Office! The upper left predator is the adult stage of long-legged fly and lower right predator is a nymph of the milkweed assassin bug (Zelus longipes). FIGURE 4. 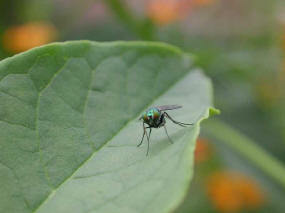 One of our Master Gardeners captured this night-time landing by a long-legged fly! Widespread across the Galveston-Houston region; seldom recognized and underappreciated. Every spring, a war erupts in backyards all over the Upper Gulf Coast of Texas. It is a vicious struggle between butterfly gardeners and spider mites over who really owns the lantana. And there is a limited defensive arsenal. 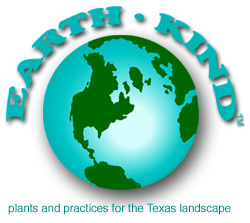 Organic gardeners who don�t use chemicals are left with the �hard-sprays-of-water� option. Thank goodness there is something in Mother Nature�s armory that targets spider mites: the long-legged fly. Long-legged flies are members of the Order Diptera (true flies) and the family Dolichopodidae, a very large and diverse group. In general, flies in this family are small, slightly more than 1/8'' to almost 3/8'' (about 4-9 mm) in length. The bodies are slender and often beautifully colored with green, blue, metallic gold or silver. Some look almost like flying jewelry! And some have dull gray or black bodies. Their two wings are clear or have darker areas toward the tips. 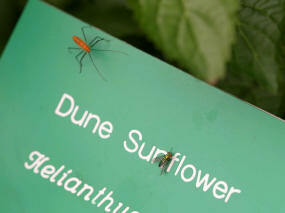 Living up to their name, the legs are long and slender. The most common long-legged flies occurring in the Galveston-Houston region (Dolichopus spp.) are � inch in length. Those long legs are no accident, especially on the males. They seem to play an important role in elaborate, unique courtship rituals in which the gentlemen show off their limbs to the ladies. Males of one species have enlarged tarsi that resemble black mittens on their front feet. On other species, the males� enlarged tarsi look like flags. So, in a reversal of what happens in our species, it�s the females who appreciate long, lovely legs! Preferred habitats for Dolichopus spp. include lightly shaded areas near swamps, streams, meadows and woodlands. 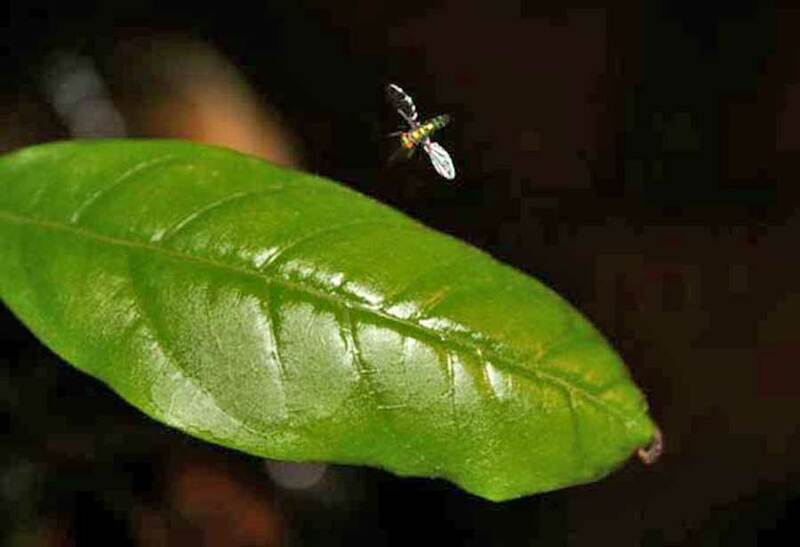 If you look closely, you may see an adult male walking round and round on top of a leaf. Larvae of long-legged flies are maggot-like in appearance and develop in wet or dry soil, rotting vegetation, or under bark through all of their instars. When they pupate, the larvae make cocoons of soil particles glued together. Some larvae eat small insects, while others are believed to be scavengers. Adult flies consume thrips, aphids, a variety of other small insects and, of course, spider mites (which by the way, are not insects, but belong to the spider family). 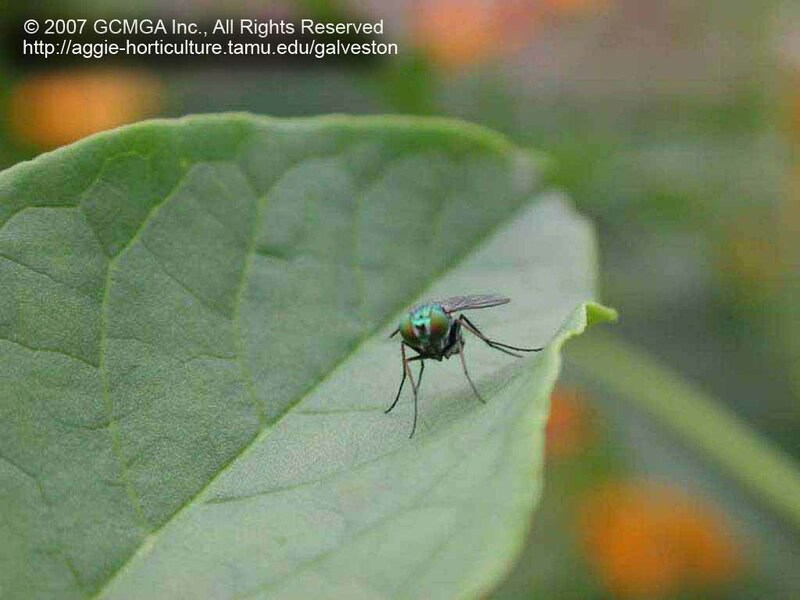 How common are long-legged flies in the Upper Gulf Coast of Texas? In Galveston County, they are very common (albeit not well-recognized nor well-known) and can be an important arsenal in the home gardener�s battle with insect pests!